Over five thousand years ago, we were gifted with the teachings contained within the 64 hexagrams of the I Ching .These 64 aspects of life are all that we have and can experience. They actualize in all planes of the Universe, operating in the workings of nature, DNA coding, the physical, emotional and spiritual bodies, as well as in family, social and political structures. Although the I Ching has its origin in Chinese culture, the underlying truth inherent in all 64 hexagrams is the same the world over, and is found at the heart of all spiritual and wisdom teachings. regardless of the words we read, the apparent differences in the viewing lens does not matter. The living truth in each hexagram is in its visual image: the energetic dance in the arrangement of its lines. 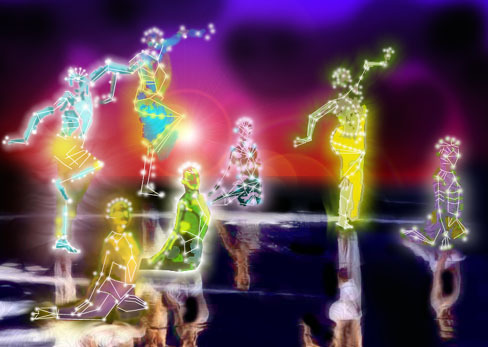 We are these living images and the dance is within us all. If we latch only onto the arousing and captivating words, we are immediately limited,and often dangerously misguided. The expression of the fundamental truth is the forever-changing image our pure heart paints, the reflection of each unique experience. The life force of these truths is in our living, digesting and sharing them - as co-creative process. I Ching and Taoist Inner Alchemy are unshakeably fused. Therefore, a discussion of one necessarily includes a discussion of the other. To help synthesize these two models, Ascending Hall produces a quarterly publication to examine the I Ching as the living dance of life. Many of the links below are excerpts from prior issues of our Mountain SKYLIGHT publication. If you are genuinely interested in learning more about humanity's present spiritual opportunity, The Four Returns of 'I' is a good introduction into Ascending Hall's ongoing journey into the mysteries of the Dao.